As I write this announcement I am looking out the window at a forested mountainside and see that the buds on the soft maples are beginning to swell and turn red. As difficult as this winter has been, spring is just around the corner and before long we will all have our hands full working our hives. Continuing our objective to cover essential colony management topics this winter and early spring, this meeting will focus on understanding swarms. Swarming has become one of the main spring topics on the Hive message boards and a major source of frustration for many of us. A quick search on the internet yields a multitude of techniques for preventing swarms including the Pagdon, Heddon, Snelgrove, Demaree, Double Screen, and Checkerboard methods and that is just the tip of the iceberg. 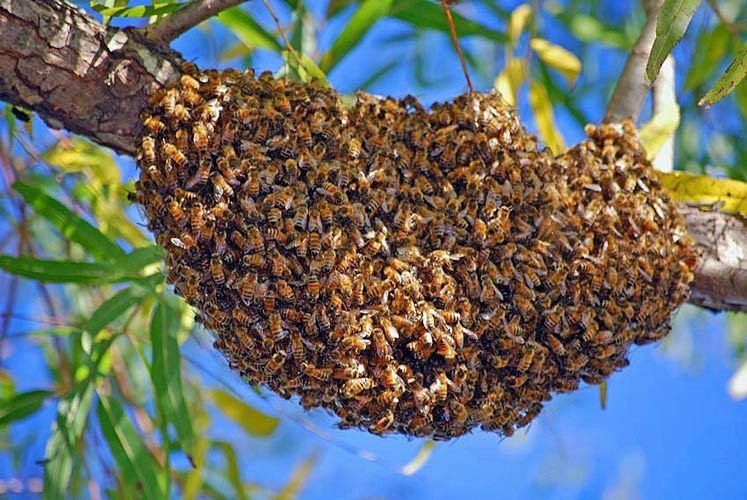 Rather than a mind-numbing discussion on all these methods, this presentation will cover why colonies swarm, how the process occurs, how to recognize a colony in danger of swarming, and why it is important to prevent swarms. Finally we will discuss what does and what does not work to stop or prevent swarms. This talk will be aimed at beginning beekeepers, but should provide some fresh ideas for even advanced members. Please join us at 6:30 p.m. on Thursday 8th February 2018 at the Montgomery County Health and Human Services Building at 210 Pepper St., Christiansburg . Close of formal meeting. This will be a time for refreshments, questions and socializing. Please consider bringing something to eat or drink. This entry was posted in beekeeper education, meetings. Bookmark the permalink.